A great kitchen layout is no accident; there are 7 types of common kitchen layouts that all highly functioning kitchens are based upon. Your kitchen layout plays a huge role in the overall outcome of your kitchen remodel. 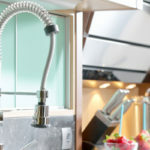 Style, color, and even materials play second string to the overall functionality of a kitchen, which has everything to do with your kitchen layout. 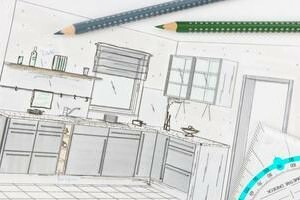 Here Are The 7 Most Common Kitchen Layouts! One-wall kitchens are common in smaller homes, and are incredibly common in studios, and other one-bedroom apartments and narrow houses. They include all parts of the kitchen, from the fridge to the oven, microwave and stove, on one long wall. Many one-wall kitchens include compact appliances, but certainly not all. Others don’t include a complete collection of kitchen appliances to make up for lack of space. The great thing about a functional one-wall kitchen is that everything is within close reach, which means it doesn’t take nearly as long to put away the dishes. Generally, the sink is sandwiched between the range and refrigerator for safety related reasons. The downfall is that all of these appliances really add up in terms of size, taking up most, or sometimes even all, of the available counter space. This leaves little to no space to store things like cookie jars or spatulas, and also it makes it hard to find prep and cook space. Try adding a small portable island cart that you can move around as needed, then click the wheels into lock and use as a prep station. Many of these portable mini islands also come with storage space, a win-win! Galley kitchens are extremely functional; in fact they were originally used in ships to improve efficiency and most restaurant kitchens are designed to model a galley style. 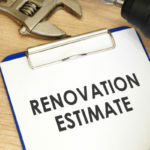 That doesn’t mean all galley kitchens are planned out appropriately, so make sure to think through everything carefully before completing the remodel. This kitchen layout is the most efficient in terms of getting stuff done. No matter how little space you have, you can virtually increase square footage by installing a galley kitchen. Traditional galley kitchens don’t include much, if any, room for people to socialize while you are in the kitchen. Leaving the cook to feel cut off from the action in the house. Create an open galley kitchen that leads into other areas of the home. This allows people to gather at the opening of the kitchen. This is a great place to put a dinning area. Give your galley kitchen an open feel by adding windows and keeping the kitchen open on both ends. This is a small and efficient kitchen, similar to a galley kitchen but with an extra wall of space, turning the rectangular galley kitchen into a square U-shape kitchen. Generally, the fridge is one wall, the sink and dishwasher is on the middle wall, and the oven and stove are on the adjacent long wall. You get the efficiency of a galley kitchen with some additional space. This kitchen does not offer space for kitchen tables and chairs, that means the dinning area is separate, once again potentially cutting the cook off from the rest of the home. Sometimes there is not enough space for the sink and dishwasher to share the same wall, in which case the dishwasher isn’t as close to the sink as you’d like it to be. You could always add in your own island, but many U-shaped kitchens lack the proper amount of space. In order to check, make sure that you follow industry guidelines and make sure there is no less than 3 ½-feet of space between the edge of the island countertop and the surrounding countertops, appliances, etc. If you really want that island but like the idea of the compact and functional U-shape kitchen, the U-shape with island kitchen layout is prime for you. This is also a great layout in larger kitchens as well. It’s basically just a slightly larger, or much larger, U-shape kitchen with an island built into the center. Plus, since it’s completely open on one side, it makes it easy to add entertaining space. 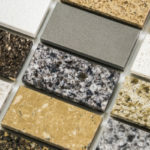 There are so many different ways to use this additional countertop surface. Some people put a sink here, others install the range stove. You could also add an island with storage and bar seating for guests. This type of kitchen truly does offer everything you need to efficiently get stuff done. The added center island gives you more flexibility. This kitchen has few if any drawbacks when properly designed. The only complaint could be someone not liking to walk around the U-shape of the kitchen, instead wanting a straight shoot to work along. Do you need an island but don’t have enough space for one? Then the G-Shape kitchen is the perfect solution. This layout adds an additional leg of counter space and cabinets to the traditional U-shape cabinet. The extra counter space is traditionally placed at a right or obtuse angle; otherwise the kitchen may become too blocked off from the rest of the home. You don’t generally install upper cabinets on this extra leg anyway, or the kitchen becomes more like an enclosed room with a large doorway. Since the extra space is typically open to the adjoining room, it provides the perfect place to set up barstools and create an area for entertaining. This is the first kitchen on the list that is actually suitable for 2 cooks to work together without constantly clashing into one another. If the peninsula is too long it will make getting in and out of the kitchen difficult, especially if you are carrying things back and forth from the dining area. You also don’t want it to be too short, otherwise there’s no room for people to sit and could deter the whole point of adding it. Make sure the added peninsula is the correct size, allowing enough space to get in and out of the kitchen, as well as enough countertop space to seat at least 4 guests. Big open rooms and loft-style living are on the rise, and as a result so too is the L-shaped kitchen. The kitchen is in the exact shape of an L, with two main walls, one longer than the other, containing the kitchen in its entirety. For instance, the longer wall may contain the refrigerator, sink, dishwasher, and cabinetry, while the shorter leg of the L may contain the stovetop and oven, as well as additional counter space and cabinetry. This kitchen allows a completely open feel, meaning no one feels like they are trapped in the kitchen, isolated from what is going on in the house. If you don’t add a portable island of some kind to your L-shape kitchen you will be facing away from your guests as you prep and cook food, which makes it harder to mingle as you work. This kitchen typically allows space to add a center island of your own, perhaps a portable one. This adds efficiency without taking away from the kitchen’s wide-open appeal. The L-shape with island kitchen offers everything and then some. Generally this type of kitchen is only found in larger homes that are working with a great deal of square footage. The island is typically substantial enough to serve as a workstation and bar seating. In other words, this is the ideal kitchen for entertaining. There are two main sides to the rest of the kitchen, one shorter and one longer, just like an “L.” This type of kitchen is more zone-orientated, due to its size. This style kitchen offers the ideal entertaining space and gives you the option to do pretty much anything you want. There’s plenty of space for multiple cooks to work together in the same space. The kitchen has 3 complete stations or zones, and the potential for a fourth zone as well. You’ll need a lot of space in order to complete a functioning L-Shape island kitchen. If you don’t like the idea of having your back facing guests, you may want to consider installing a burner on your island, leaving room for countertop space as well. This ensures you can watch over the food and simultaneously interact with guests. 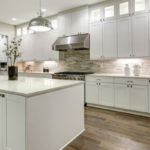 No matter what kitchen floor plan works best for you, Tops Kitchen Cabinet has the best deals on the highest quality cabinets, countertops and more! Our wholesale prices won’t break the bank, allowing you to score a top-notch kitchen for less.